Clyde arrived about a year after we took on Bonnie and slipped comfortably into the role of her husband. A rescue dog found by a neighbour in Roath Park he was six months old, according to the vet, and already a reasonable size. 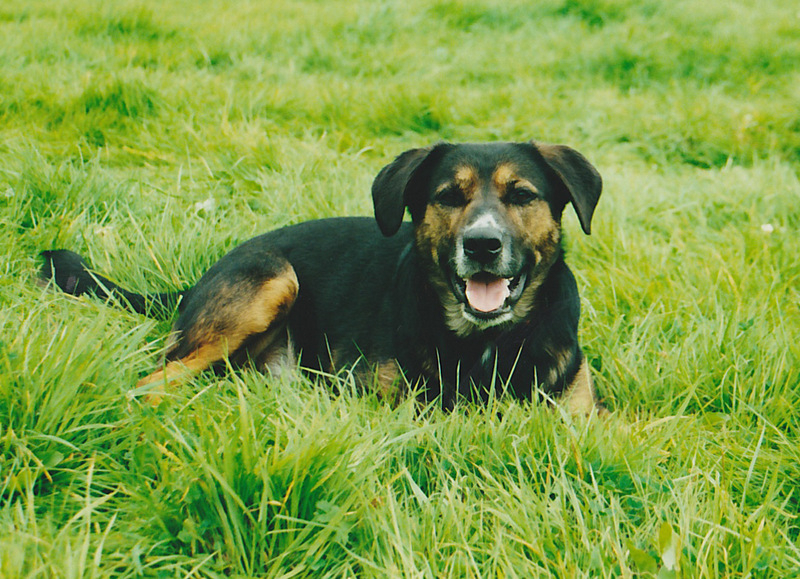 A Heinz Variety, possibly part Rottweiler, Clyde became Jacob‘s dog, as Hope had a male hamster called Wendy and Bonnie belonged to Anna. Although his chewing phase stretched our patience to the limit, he had a penchant for Dr Martins and Sylvanian toys, he made up for it by being incredibly loyal and a ‘real’ dog. By ‘real’ I mean he was not bothered with home comforts. He preferred a cold tiled floor to a dog cushion, he sat outside in the rain, he loved camping and a true example of man’s best friend slept at you feet. Clyde demanded respect not just because of his size, he asked for it. He was a talking dog and would sit, fixing you with a stare, making various sounds which I am sure were his attempt at speech. If that didn’t grab your attention then he was extremely adept at hooking his nose under a protruding elbow to give you a nudge often, and with alarming regularity, when you had a glass of wine half way to your mouth. Many visitors left our house with red wine stains down their front. Although never vicious he could at times be intimidating. If we ever play fought as a family he would muscle into the foray attempting to stop it. Once when rubbing my sons bare feet against the bristles on my chin whilst he lay on the sofa and causing him to squeal, Clyde got into position, astride Jacob’s feet, almost nose to nose with myself and gave a low menacing growl. I stopped. Another time on returning from a camping trip to Cardiff he pinned a passer-by to the hedge as we climbed out of the car. The poor gentleman had obviously been either too close to our house or in some way was perceived as a threat to the family. Clyde would eat almost anything. Curry, chilli, tomatoes, cucumber even lemons were fair game. We think he possibly developed the taste from scavenging at the numerous takeaways in our area before we took ownership of him. He was also an adept thief, snaffling any titbits that were too close to the edge of the table when no one was looking. The thing he loved most, water (like Jacob). Not daunted by the waves at the sea and diving to the river bed to retrieve large rocks that he would bring to the shore, depositing in a pile, to what purpose we could never figure. 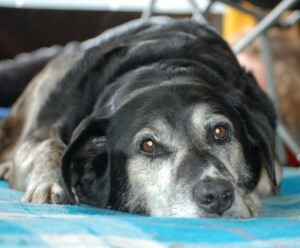 Loosing Clyde, especially so soon after Bonnie, has left a massive dog shaped hole in our lives. The house has just not been the same with both gone and it will take time to acclimatise but they lived good lives and were loved by everyone. Select this photo to view a gallery of photos of Clyde. 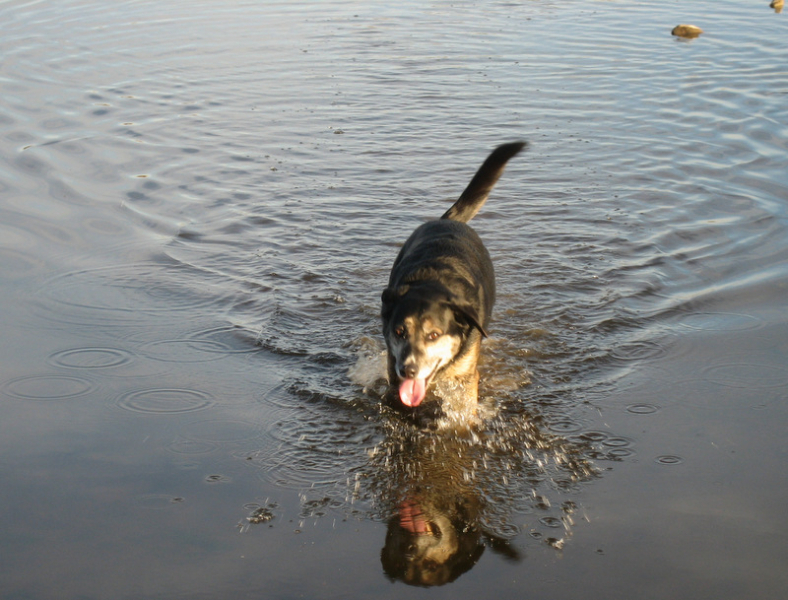 This entry was posted in Husband, Father, Dog Walker, The Rest and tagged dog, Dogs by RedEyedMonster. Bookmark the permalink.